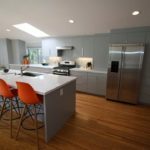 For the Sullivans, homeowners in Chino Hills, Orange County, the goal of this kitchen, bathroom and living area remodel was to design a space that was of course, functional but was also sleek and modern. 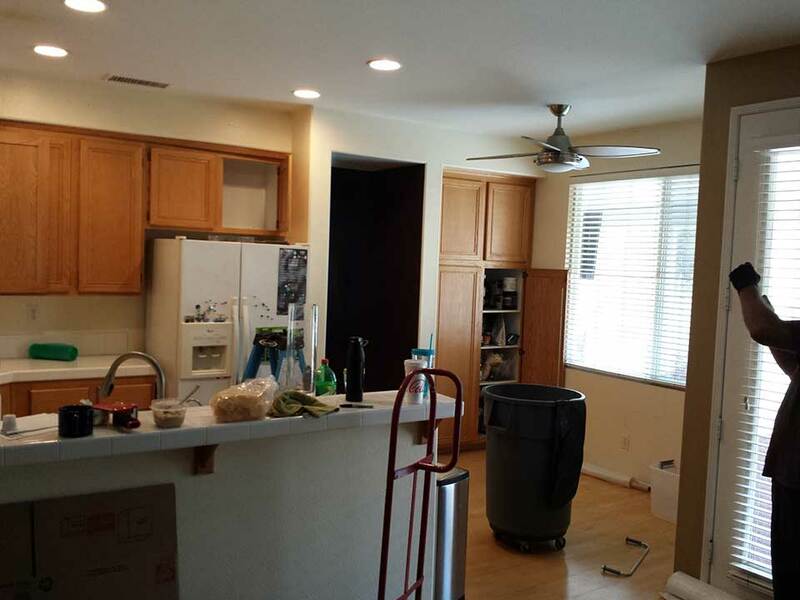 Before the APlus remodel, the kitchen of this Chino Hills home was bland, outdated and just felt boring and unoriginal. 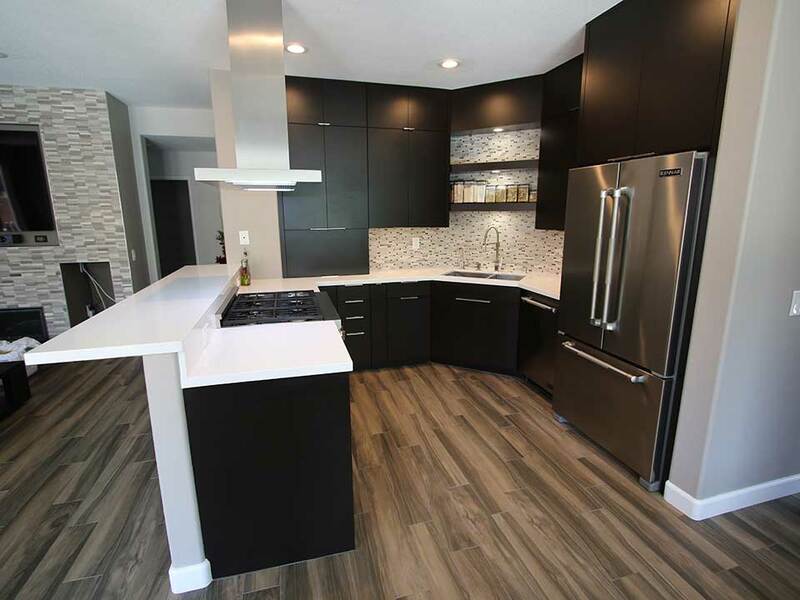 It featured standard-grade cabinets in a light wood tone, the countertops were white tile, and there was limited space and storage. 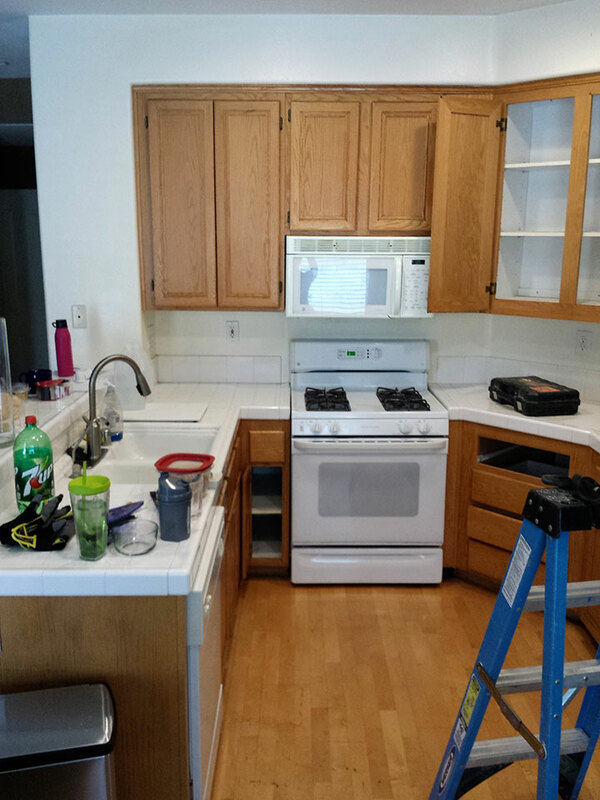 Because of the limitations in terms of storage, there was clutter that found its way onto the countertops. The bar was incredibly thin in width and offered little space for eating. 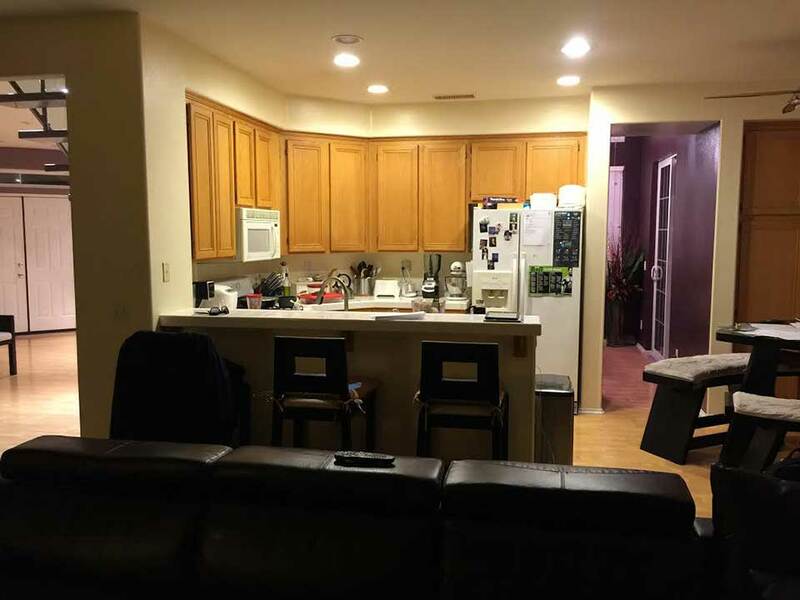 There was a nook to one side of the kitchen with a small table, but it felt cramped and almost unusable, much like most of the other areas of the kitchen. The color palette was murky, and everything felt unremarkable. 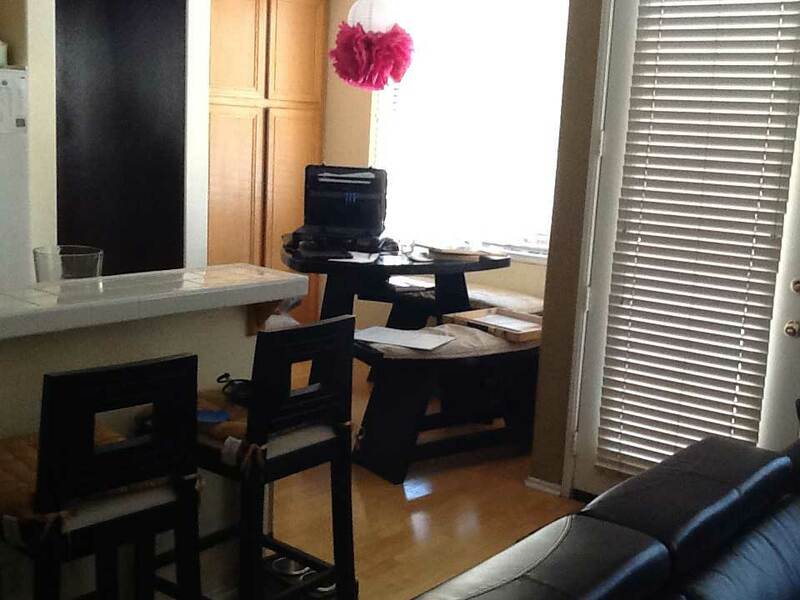 Much of the countertop space was tucked away into tight corners, leaving little workspace in this Orange County kitchen. The powder room that was also part of the project included no cabinetry and a floating sink, along with a dark wall color that just didn’t work in the small space. 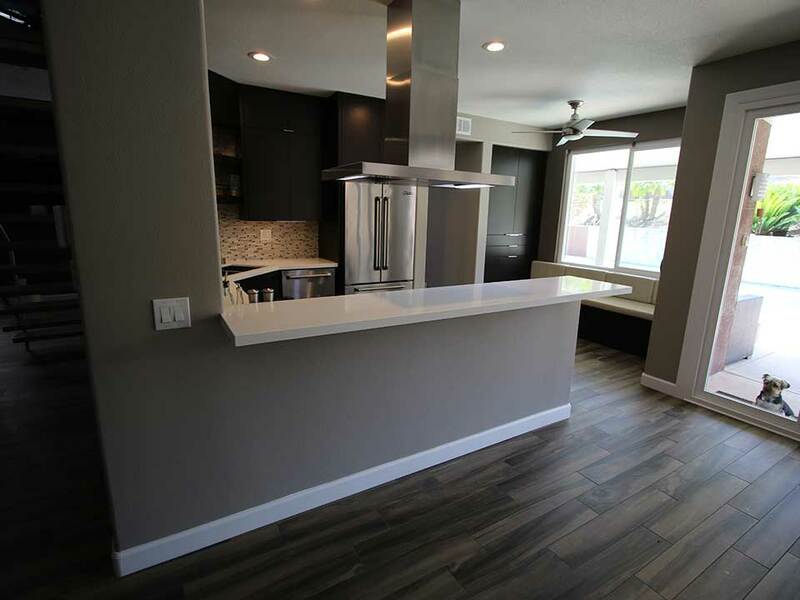 The first thing we focused on during this Chino Hills kitchen project was to add more countertop space and widen the bar enough to make it functional. We added a sink in the corner, and above it, floating shelves accented by the mosaic tile backsplash which we carried upward. The crisp, white countertops with square mitered edges juxtapose the cabinets, which are true showpiece in this project. 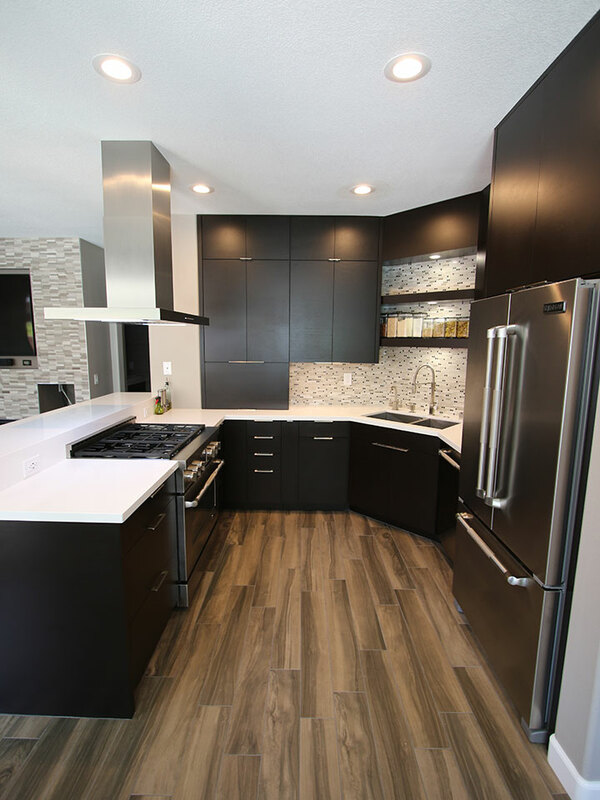 To maintain the modern style the homeowners were after, we created custom Euro-style Sophia Line cabinets in a decadent, Dark Manganese finish. 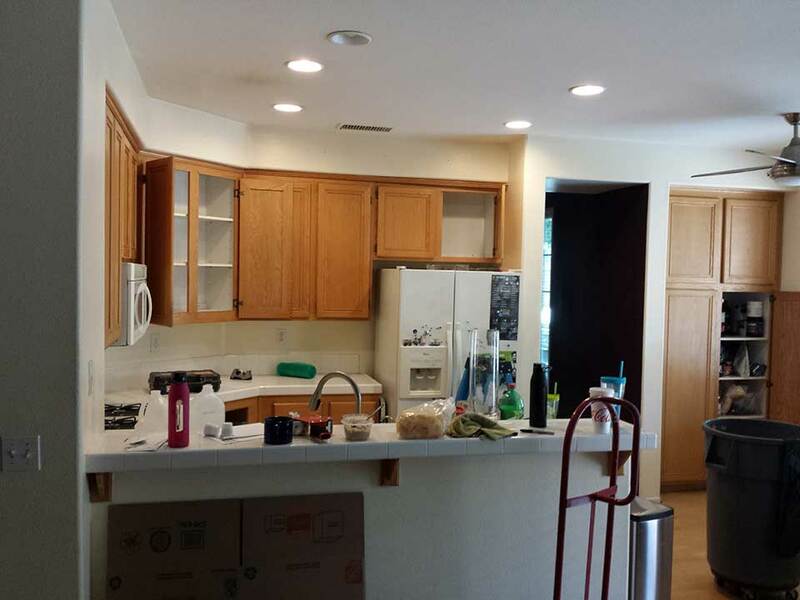 The cabinets have no panels, retaining the sleek, clean lines that were pivotal in this modern remodel. The Sophia Line cabinets have a horizontal grain throughout, and the tall cabinets have a contrasting vertical grain for subtle visual interest. The custom APlus cabinets include features such as toe-kick drawers and vertical tray dividers. The appliance packages include an Empire under mount double basin sink from the Everest Collection, and a Jenn-Air 36-inch range and a floating 42-inch stainless steel hood. 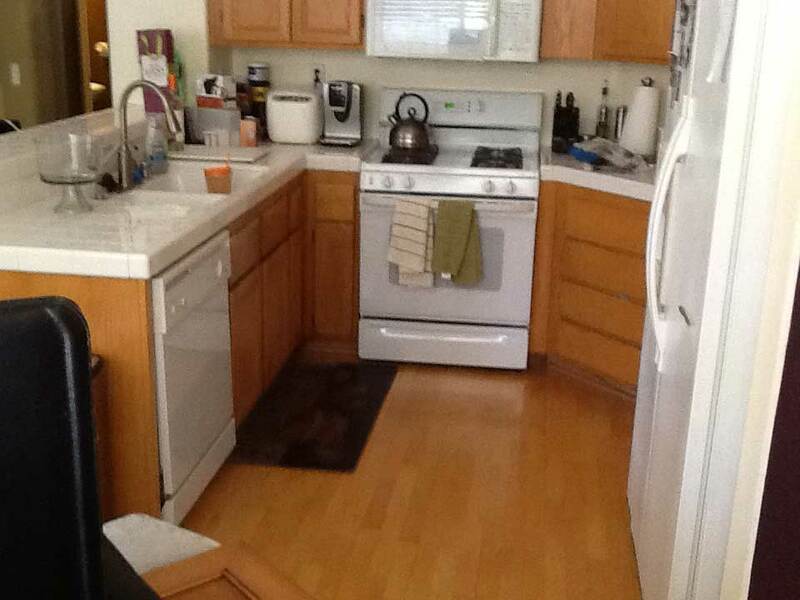 There’s also a Jenn-Air under-counter microwave drawer. The hardware used to accent the custom Sophia Line cabinets is installed horizontally. Where there was once the small dining table, there is now a custom built-in banquette-style bench and a pantry that matches the style and design of the rest of the kitchen cabinetry. 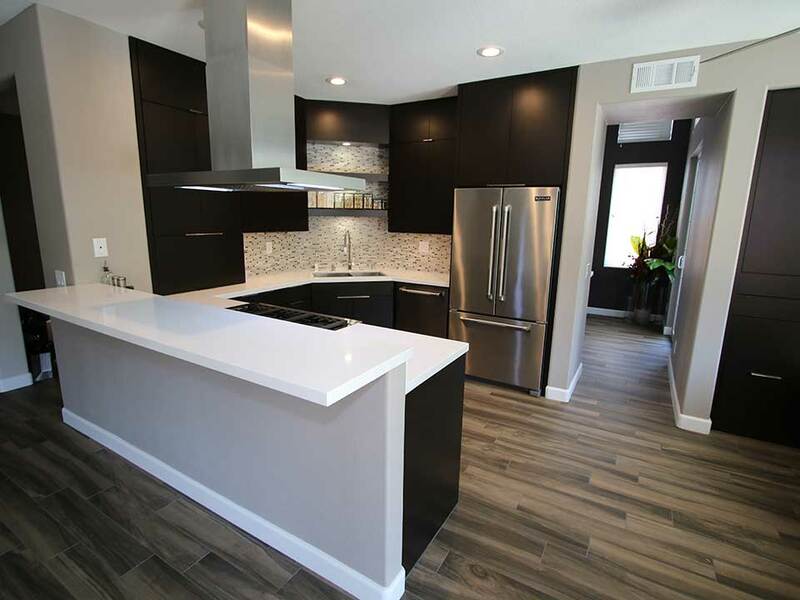 Throughout the kitchen and living area, there is richly detailed plank flooring with varying shades of gray. 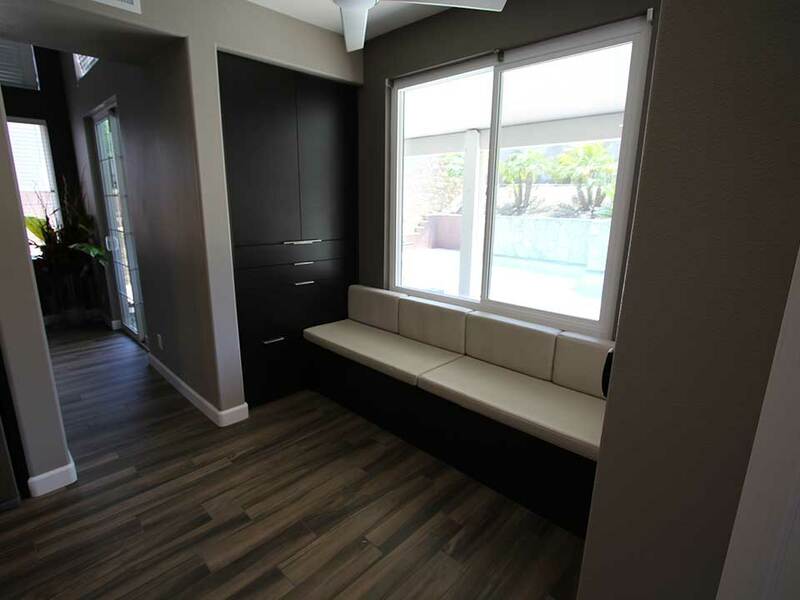 As part of this Chino Hills home remodel project, we also revamped the adjacent living area, keeping the open-concept floorplan and ensuring streamlined style and cohesion between these spaces. 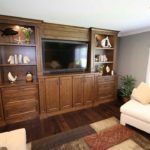 A tiled feature wall is also used as an entertainment center and fireplace, while tiled planks add modern elegance to the connection wall. 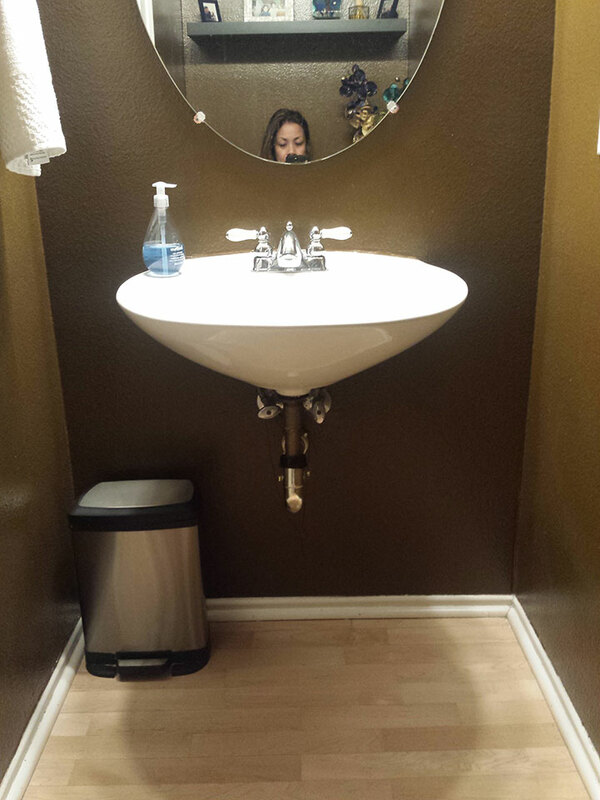 In the downstairs powder room, we added a contemporary vanity with a wide raised basin white sink. 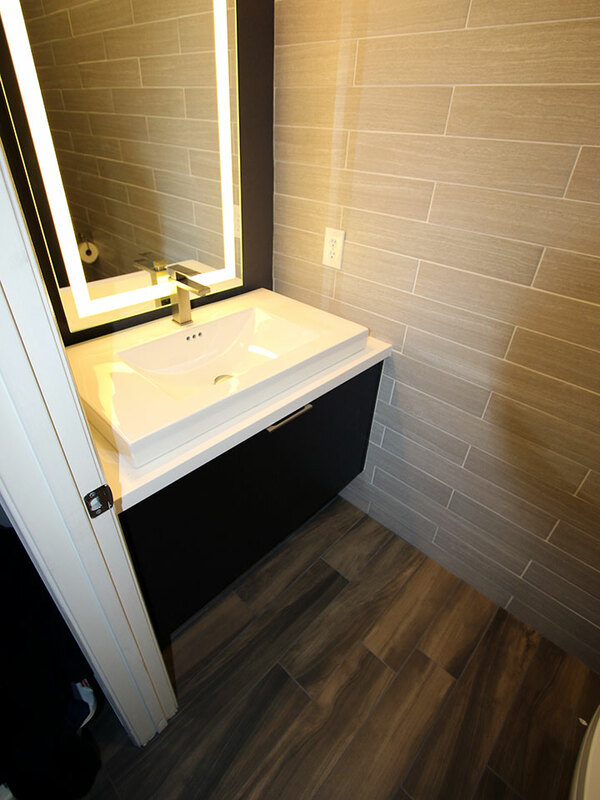 The bathroom includes the same wood flooring in the kitchen and family room, and we again added a plank tile feature wall. 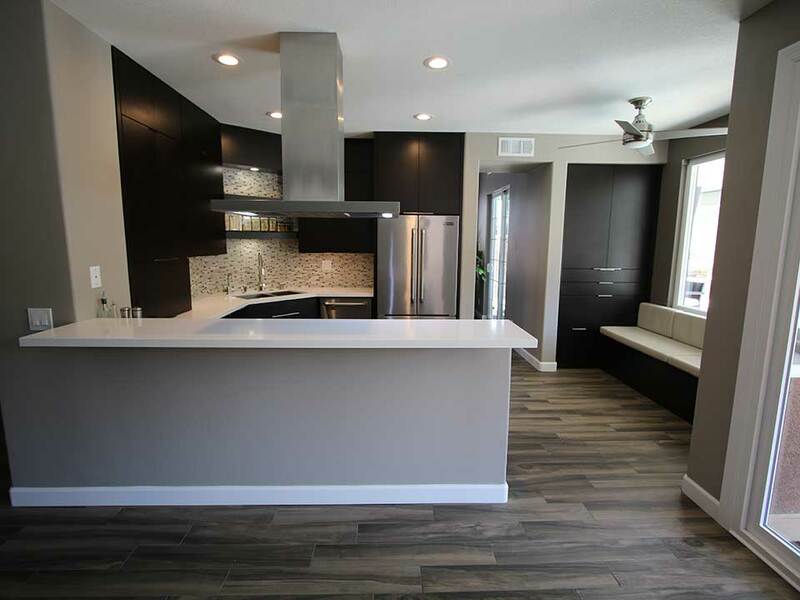 The result of this Chino Hills remodel is a kitchen and downstairs living area that went from dull and standard, to completely modern. There is a sense of drama in the dark richness of the Sophia Line cabinets, while details like white stone countertops keep the overall style clean and relaxing.